View of “Charlotte Greene and Lionel Maunz: Lamerica,” 2017. Imagine Alice falling through the rabbit hole into a cyberpunk dystopia, and you might have something like Charlotte Greene and Lionel Maunz’s current exhibition, “Lamerica.” It is housed in a subterranean, bunker-like gallery space, a fitting arena for posing questions about living in an age when humanity’s destructive traces can be felt everywhere. Gathering materials that include fake leaves and real butterfly wings, Greene’s diminutive works call to mind Bruce Conner’s assemblages yet feel largely their own, evoking a fascinating range of ecologies. The oddly appealing Cyborg (all works 2017) collapses the artificial and the natural by combining a gray and feathery wasp’s nest with a deflated Mylar party balloon. IUD (Manufacture, Succeed), a collage on a narrow plank of wood, features a striking image of a gorilla with impossibly elastic limbs. One can imagine the artist using spit to glue the different elements together, the way wasps wet the fragments of wood that become their papery nests. Maunz contributes one large work: the H. R. Gigeresque sculpture Annunciation. 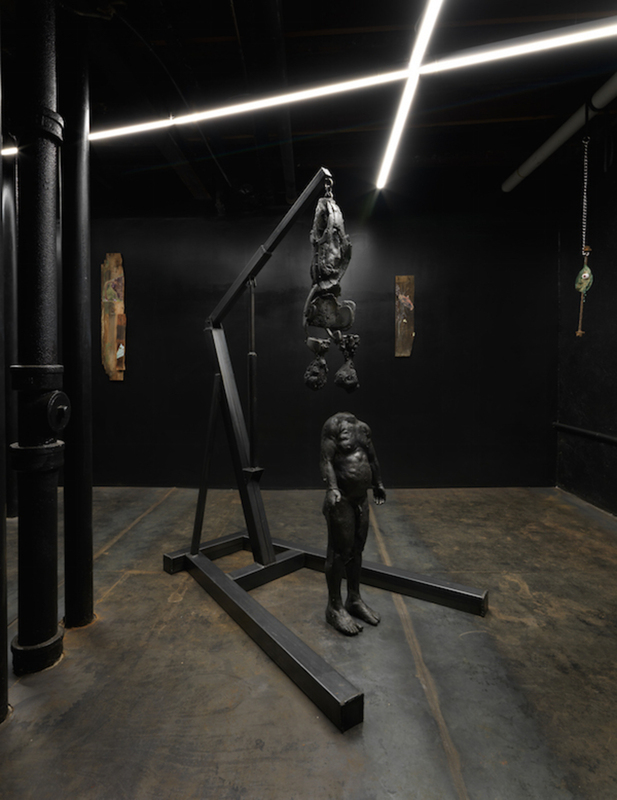 Cast in steel and iron, there is nothing angelic about this work’s mechanical exoskeleton, readying itself to descend upon the headless, fleshy body of a human male. Maunz’s monument suggests the scary outcome of human-machine amalgamations, perhaps necessary to armor oneself against an uncertain, Terminator-style future. By contrast, Greene’s more delicate and fugitive pieces present a vision of posthuman existence that is more pragmatic about our temporary stewardship of this planet. Both artists conjure new forms of survival as they project themselves into a tomorrow that is already, frighteningly, here. Both also undo, in different ways, the polar opposition between nature and culture that has led to our current environmental impasse.